Here's a really innovative way of conning people. 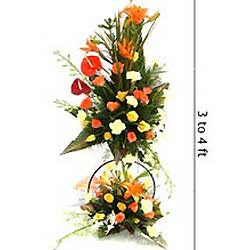 Start an online flower delivery service which caters to remote locations. If someone sends you flowers, how often do you call them up and thank them (mentioning exactly what the order received was)? Do you think anyone would really complain that they've received an order of flowers from you with a poor quality gift? They'd sit there saying "How considerate... what lovely flowers..."
Okay, so here's the deal. Place an order for some flowers (with maybe a gift attached to it). Pay a premium on the delivery (since it's timed so well). When the wrong arrangement arrives (with slightly wilted flowers), you, the orderer, would never really find out as they'd be masked through the "niceties" of society. Let's give you an example of this. I'd ordered the Exotic Life Size Arrangement from fnp.in. The description? 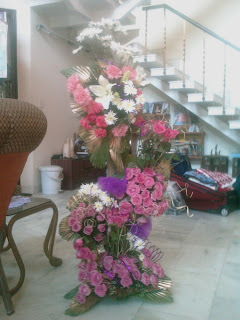 Mind blowing arrangement of 100 Seasonal and Exotic Flowers..3 to 4 ft high…for someone very special in your life.. This was supposed to be sent to my mother (who coincidentally lives in the same house as I do at the moment), so when the delivery arrived I was at home to receive it. Okay, so now you're thinking "So what actually got delivered?" 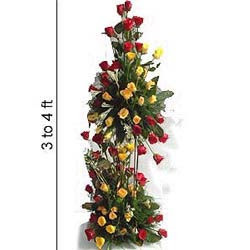 Your feelings reach new heights with this expression of LoveÃ‚Â….An arrangement of over 100 Red n Yellow Roses of around 4 feets high. 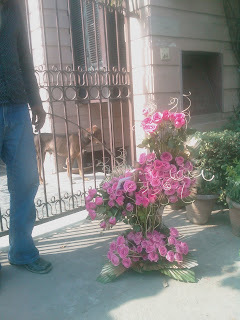 What actually arrived was however quite a few (definitely more than 70) pink roses about as tall as my dogs (how does 2½ ft strike you?). It was quite nice in a few ways, but nowhere near what I'd ordered. The order process itself was difficult enough. Yatra.com advertises a partnership with a discount of 25%. They even give you a promo code to enter on the fnp.in site to avail of this discount. When I tried using the promo code I got a "Sorry!! Try again" repeatedly. I thought it may be a problem with the code I was given, so called up Yatra (where a customer service person asked for my user names and passwords on both Yatra.com and fnp.in – I even provided them in the interest of getting this worked out). They acknowledged that there was a problem with the fnp site. I tried using an alternate promotion (for ICICI bank account customers) which gave me the same error, so called the fnp customer care and was asked to "please try again in half an hour as there may be a technical issue". Strange that 22 hours later it's still not working with ICICI. I got a little fed up with speaking with the person on the phone so left a comment on the website about the it not working properly and was surprised (quite pleasantly) by a call from Ashish the webmaster who informed me that he could help me with my order if I could order it on my ICICI card (and get a 20% discount instead of 25%) as they'd stopped the promotion with Yatra for Diwali (but still hadn't contacted Yatra with this information). I mailed him the order details (along with my ICICI bank debit card details – I was wondering how he'd get the payment through with this info, but he'd asked me for it so I sent it). I got a call back a few minutes after sending the mail saying he wanted a credit card rather than debit card. I don't have an ICICI bank credit card, so gave him my HDFC credit card information for him to use, which he said would be okay. I'm still sitting here waiting for the correct order to be delivered. The instructions for delivery at 9am sort of went down the tubes when the incorrect order arrived at 10, followed closely by a phone call from the "head office" which I passed on to the delivery man. I'll possibly update this if the correct order arrives. It's arrived... and just as I was getting on the phone with the company again. They've added a top to the original one they sent, not quite what I'd ordered, but it' still nice. I don't think I'd have written this entry if this was the first time I'd had such problems with them, but then I didn't get to see the last order they'd dispatched and assumed it was a one-off mistake. Hope they're not doing the same thing with you. is the truth you see! or indeed what you'd do. Where would that leave me? but you'll never find out. by what you will see. till the day I go. This one's dedicated to the one who knows. till your conscience is broke. people want to know YOU. No ill intent is meant by this pome. It's inspired by the hypocrisy of our culture symbolised by the most open societies, which went to war to hide the openness. I started this article on the 15th August 2007 (our 60th anniversary of independence) and didn't have the energy to complete it. Most people (for some reason) don't realise how much I love my country. India is a place filled with people with completely different outlooks, backgrounds, concepts, religious beleifs, sensitivities, intellectual abilities, blah... you're probably sitting there thinking "all countries would have this". There's diversity in geographic topology. There are so many different types of places with so many interesting things to see, but the thing that really builds this place is the people. I have the option to live and work abroad (it'd be somewhat easier for me since I don't need a visa/work permit to get a job in the UK since I've got "Right to abode" there). India has spoiled me. I'm lazy. There's a maid who comes in the morning, cooks, cleans, washes the clothes, irons them, answers the phone when there's no one around, handles the house by the day so to speak. Then there's the odd job guy who washes the car, walks and feeds the dogs, takes care of the garden, repairs stuff around the house, cleans the outside area of the house. Essentially, there's someone to do anything you don't want to and it's usually not too much of a problem to get the stuff done because labour is cheap here. Does this make me a hypocrite though? How independent could I be if all the stuff I've got to get done get done by other people? Am I dependent on them? I'll put it this way. I know the "how's" of getting most things done, but don't ever need to actually implement anything myself as long as they're around. When they go on leave, I don't exactly shrivel up and die, but I DO have a bit more to get done. That having been said, let me ask this. How can I afford this luxury? Having two people spend quite an amount of time getting my work done for me should be an expensive deal right? The truth is that these people work on a monthly basis for a combined amount that I'd make in a few days. And no - I'm not earning a particularly large amount of money. These are the gaps. This divide isn't terribly healthy. The people who work in junior positions in government jobs - the paper pushers or gate keepers (depending on what your work in that department is) get salaries that would allow them to buy a small TV in a month if they didn't spend anything on anything else. Add a wife and a couple of kids to that equation and you get a materialistically challenged family who look around and see all these rich kids in their designer clothes, driving flashy cars discussing how much they spent last night at that nightclub. What do these guys do then? How about making life a little miserable for all these rich kids. If he comes here to get some work done, let me pull all stops to irritate him to even things out just a little bit. And what's the response? Rich kid pulls out a few notes and passes them to the guy to "smoothen" things out a little. (newly) Corrupt government man decides this isn't a bad way to make a little extra money, so winds up hassling anyone who comes through the door expecting money and when he doesn't get any starts demanding it. A cousin is registering his company here. He'd given our house address as his correspondence address, so when his registration letter arrived by registered post (recorded delivery), the post man came home to deliver it. Registered post requires a signature, so it wasn't just dropped in the post box. The maid didn't know my cousins name or the name of his company, but offered to sign for it. The postman gave her a phone number and left with the letter. My mother called in the afternoon and offered to pick up the letter, but was told that my cousin would have to make a personal visit to the post office as it must be some paise ka mamla (money matter). My cousin was in town the next day for a few hours, so had planned on picking up the letter in the morning, running to interview someone and leaving. At 10 am when we called the post office, we were told gyarah baje tak aajao (come by 11 o'clock). It was 10 so Ma offered to reach there in 5 mintues and was told nahin gyarah tak aajao (no come by 11). I'm not sure why, but this went up and down a few times before Ma finally said "We'll be there at 11" and put the phone down. At 11 we went to the post office, expecting to pick up the letter, feel a little happy and leave. We were called into the office where one man took the letter, held onto it and sat down at a table telling us (I couldn't continue writing after this, so I took a short 9 month break) that he needed to see the letter of registration of the company before he could give us the letter (which incidentally was the tax registration letter a requirement for registration of the company). An hour before my cousin had to catch a flight we were slightly pressed for time so my cousin pulled him to the side and asked him exactly why he was doing this, to which the blatant response was "300 rupees". There are two options at this point. Pay and get it done with or leave, let the process get delayed by another few weeks and pray that you have the contacts to squash this bug - who'll land up in another post office and do exactly the same thing there. Look at it this way. You have a company to register where the registration process gets stopped at a few thousand different places where each person demands x amount of money - all the amounts are individually very small, but they sort of add up when there are so many people to "handle". What solutions have been devised to get around this? Enter the tout! You can actually HIRE people to do the running around (read bribery) for you. They will give you a "99% assurance" that all your work will get done for an amount that would be a little higher than the amount you'd have to bribe people with. Why is it only a little higher? Because it's like a nexus. The tout would be running a "revenue-share" concept with the officials (and their office boys) he's dealing with. It's possible here (and on many occasions necessary) to have someone NOT hassle you for a fee. There are a massive number of cabs operating between Delhi, NOIDA and Gurgaon. A friend struck up a conversation with a cab owner and got the dope on why they drive as badly as they do (that's not exactly how the guy put it, but it's quite evidently the reason). For each cab owned by the cab company plying on a regular route, the company has to pay the DELHI POLICE a particular amount per intersection to "look the other way" for all traffic offenses. Most cabs tend to jump red lights, stop in the middle of the road to pick up and drop passengers, jump lanes at will (is there a car in that lane? Too bad... he's going to have to move away), tamper with the speed governors (they're supposed to be limited to 50KMPH) and generally increase the chaos on the already chaotic roads. They've got amnesty. They'll do what they want, but when they start killing people I'm almost certain the price goes up... price? PRICE? There have been instances where actors/influential people/wealthy individuals and/or their children/relatives have been involved in well publicised manslaughter/homicide (driving, shooting, blah...). They've been all over the national papers (gossip rags). They've gone to court. They've come back out of court. They're resting at home happy to be free having (possibly by mistake, but never the less) killed someone. As long as people HAVE to pay someone to get basic work done we're not free. As long as the government votes itself to power (by buying polling booths and peoples identities) we're not free. As long as the people responsible for removal of corruption are the ones ASKING for bribes WE ARE NOT FREE!